In the journey out of the institutional church structure – and the recovery from its effects – I have discovered a few things that I’d like to run past you. The biggest thing is the realization that my focus has always been askew. We are schooled in the art of “church” by those who have come before us. They, in turn, know what they know as a result of the study of those who came before them. So, here is my question: What if those we revere as “church fathers” were off in their theology or doctrine one half of one degree? Here’s what I mean. Let’s say you got in a boat in Savannah and set sail for England. And let’s say that your compass – unbeknownst to you – was inaccurate by one half a degree. Where do your think you would land your little boat? I’m not sure either, except, I’m sure it wouldn’t be England. What if those guys were off just a little bit? What if the course corrections made over the years were not enough to put us back on the course toward sound doctrine? Of course the answer is pretty clear: We aren’t where we think we are. My understanding of “church” was attained by the standard course: Study of the old guys and my own experience mirrored against Scripture. But in coming to the brick wall of revelation I hit in 1993, I discovered one excruciatingly simple truth – it’s not about what I thought it was about. Well, here is the first brick in my new revelation. Christianity – the whole enchilada – is about fellowship. The rest is one tradition of man slathered upon the previous. Anything that kills fellowship is sin. Anything that hinders fellowship is to be shunned. Anything that is about stuff, or programs, or organizations is anti-fellowship and is therefore anathema. There was an exchange between Jesus and an expert in the Mosaic Law. "Teacher, which is the greatest commandment in the Law?" Jesus replied: "`Love the Lord your God with all your heart and with all your soul and with all your mind.' This is the first and greatest commandment. And the second is like it: `Love your neighbor as yourself.' All the Law and the Prophets hang on these two commandments." (Matthew 22:36-40). There it is: Fellowship with Father and fellowship with one another. Some might say, “Yeah, but that was Old Testament stuff.” Jesus answered that question when He made it clear, “Do not think that I have come to abolish the Law or the Prophets; I have not come to abolish them but to fulfill them.” (Matthew 5:17). So, what does it mean when He said He fulfilled the Law and the prophets? Simply this: He pulled it off in our stead; that is, He obeyed every jot and tittle and in Him SO HAVE WE. Closely scrutinized, the Law motivation behind every law was founded in relationship. Observe the Ten Commandments from this angle. Here is an excerpt from my book, Escaping Church. To help understand what “sin” is, it must be understood in the context of First John. Anything that is a fellowship breaker is sin. Even the Ten Commandments adhere to this standard (Exodus 20). Every one of these commandments indicates a fellowship killer. The first commandment warns against breaking fellowship with Father. The second warns against replacing fellowship with Father with something created. Using Father’s name in vain is a clear violation of fellowship, as is spending the Sabbath for yourself instead of for Him. The fifth commandment protects the relationship between parents and children. Killing someone is an obvious fellowship breaker. Committing adultery clearly breaks the intimate relationship between husband and wife. If you steal from someone, then fellowship will surely be destroyed. Fellowship cannot live in an atmosphere of lies. And finally, coveting makes it about their stuff and not about your relationship with them. All sins are fellowship killers. So, what are we saying? Followers of Jesus are to be about one thing: Fellowship. I have not been a great fellowshipper. The damage in my life has hindered me from being the people-lover I was born to be. Oh, sure, I have been a pursuer of fellowship with Father – such as it was – but changing my paradigm to place as much emphasis upon fellowshipping with you has been a difficult alteration. For years I was under the delusion that I hated people. Most pastors understand that, right? But in my journey out of the traditional church system I discovered that I didn’t hate people, I was just afraid of them. Put me in front of thousands and I am right at home. Put me in a room with one guy I don’t know? Yeah, there’s a panic attack right around the corner. It makes sense that Father would call me into small group ministry! Anyway, my journey has been about learning to fellowship with people, not to preach at them or teach them something, but just to be at home in their presence. That may not seem like much, but it means the world to me. 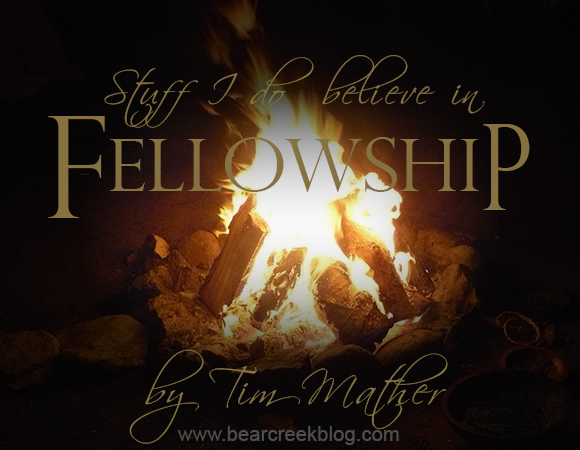 So, here’s the first thing I believe in: Fellowship.